St. Augustine, Florida is one of the most unique places we have ever visited. Its history as the oldest city in the United States combined with its waterfront location and charming accommodations makes it both a Bucket List destination and a favorite place to return to and enjoy again and again. If you are staying in St. Augustine, The Old Powderhouse Inn Bed & Breakfast is an excellent choice with an incredible history, beautiful accommodations, extraordinary breakfasts, gracious hosts and a perfect location in the heart of the Historic District. We found breakfast at The Old Powderhouse Inn Bed & Breakfast to be a delight.Guests are seated at tables for two where they can choose to be as private or as conversational as they choose to be. Within moments of being seated by Katie, everyone was engaged in friendly and humorous conversation during our stay. Guests were also sharing tips on their favorite local attractions and restaurants. Military personnel, firemen and law enforcement officers receive a discount of 15% off regular rates. If you may be wondering about the origin of the name The Old Powderhouse Inn Bed and Breakfast, there is a wonderful story behind that too! Under the Spanish rule in the 18th century, the property's structure housed the gunpowder used by the soldiers at the nearby fortress. An 1870 description by one-time slave Jack Smith verifed the location and thereafter the property was referred to as The Old Powder House Lot. The present structure which houses The Old Powderhouse Inn Bed & Breakfast was built in 1899 and retains much of the original character of the Flagler era - Victorian architecture, high ceilings, verandas, and elaborate wood work. 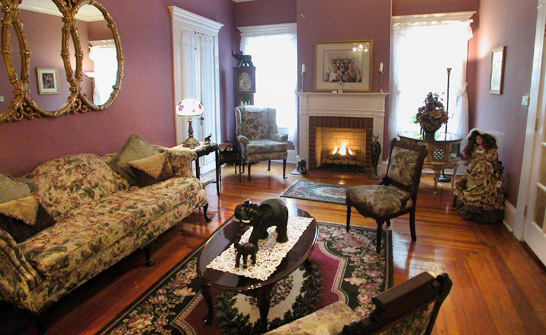 The Old Powderhouse Inn Bed & Breakfast is located at 38 Cordova Street Saint Augustine, Florida, USA 32084. We highly recommend The Old Powderhouse Inn Bed & Breakfast as an excellent choice with an incredible history, beautiful accommodations, extraordinary breakfasts, gracious hosts and a perfect location in the heart of the St. Augustine Historic District.